Victorian architecture covers the time of England's Queen Victoria's reign from 1837 to 1901. During Queen Victoria's reign, which spanned 64 years, England prospered in part due to the Industrial Revolution. The growing middle class had greater economic opportunities, including education and better homes. There were few wars during this era, so society throughout the industrialized world thrived. Time, energy and money were focused on growing and improving the average person's quality of life. With newly created modern conveniences, many variations of Victorian architecture evolved. Trying to wade through so many architectural styles of this era can be a daunting task. Below are most of the styles you probably know as Victorian period-style homes. This is probably the most recognizable form of architecture you associate with Victorian architecture. 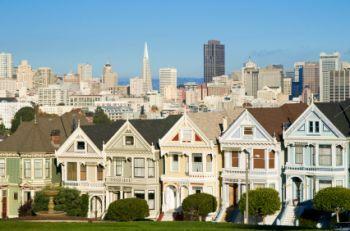 The most unique collection can be found in San Francisco where the phrase "Painted Ladies" is used to describe the multi-colored Victorian row of houses. The father of Arts and Crafts was British author, John Ruskin, whose writings romanticized craftsmen's work ethic and pride. Ruskin's musings inspired a romantic movement that showcased the skillful work of master craftsmen, later termed in America as the Craftsmen style of architecture. Borrowed elements found in Gothic Revival architecture to contrast between the modern popular styles and the medieval forms found in Gothic architecture. Vertical Board and Batten - Exterior siding and interior paneling created by alternating wide boards with narrow wooden strips, called battens. The Industrial Revolution burst into the Victorian era and eventually brought electricity and the ability for manufacturers to mass produce. This meant middle-class Americans could own homes or dress up square-styled homes to replicate the grander homes with customized woodwork. Artists and architects created this style in a modernist opposition to the highly ornate and decorative Rococo style (Baroque era) used in extreme-styled Victorian architecture designs and furniture. Neoclassical relied on the clean simplistic lines of Classical Greek architecture. Everything but the kitchen sink style of architecture, tried to include as many aspects as possible of the other revival styles, using Greek, Gothic, Baroque, and Renaissance. This hodge-podge of combinations made Neo-Renaissance difficult to classify since most buildings could fall into some part of the Neo-Renaissance descriptor. One of the most famous design features of this style is the Queen Anne Cabriole Leg used in furniture. The elegant style is readily recognizable because of the clean lines and curved form. Architecturally, this style is very elaborate with high ornamentation. Mimicked Roman architecture having a massive quality compromised of thick walls. Stone was the main material used for this type of architecture. These homes resembled castles, although on a smaller scale. Romanesque was a popular choice of architecture for very large buildings, such as museums or government buildings. The opposite of classical forms of architecture, Italianate was quickly embraced by Victorians. This architectural style was a combination of Victorian architecture and Federal styles. This style was most popular between 1865 - 1880 and was imported from France to the United States. Quoins - External cornerstones often lighter colored than rest of house. Rectangular tower - Either same height as top floor of home or extends above roof. Mansard Roof - Two slopes per four sides. Lower slope with dormers is steeper than upper slope, which can't be seen from the ground. Paired Columns around windows, dormers and doors. There were numerous architects whose creative visions designed and formed the varied styles of Victorian homes and buildings. If you want to build a home in the style of Victorian architecture, you now realize how many various designs and styles are available to you.